For many IT departments, this scenario is probably familiar: SysAid has been successfully implemented in your organization and its configurations carefully set. As you prepare for a more organized and standardized process of handling service requests, the phone rings - the Internet isn't working in Human Resources. A coworker then grabs your arm in the hallway and describes the error codes that inexplicably pop up on his screen. When your end-users submit service requests with SysAid, you can solve their problems faster and more efficiently because SysAid helps you prioritize, organize, and quickly follow-up. The real challenge is: how do you get your end-users to use SysAid and appreciate its benefits? This August, let's channel our creative juices towards an exciting development that's gaining momentum with SysAiders around the world - The SysAid Internal Campaign. What is the SysAid Internal Campaign? It's a simple yet powerful promotion to raise awareness about SysAid in your organization. When end-users understand the value of SysAid, their enthusiasm about the results will push them to use SysAid again in the future. For you, this means reduced workload and increased appreciation of your IT department's activities. To kick off your own campaign, check out the presentations below. With tips, ideas, and insights, we've done the work for you. Now's the time for you to see the results your IT department deserves! IT's the Real Thing: Sarit Hershkovitz of Coca Cola pushes for change. 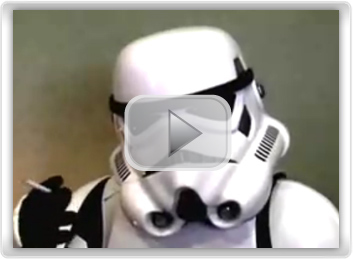 Joke: Stormtroopers as IT administrators on the Death Star! Most of us probably do not associate the world's most popular soft drink with IT - unless, of course, you're the type that enjoys a cold Coke while resolving user issues. For Sarit Hershkovitz, Coca-Cola is more than a beverage; it's a job that requires a sophisticated team of experts to provide non-stop technical support for all sectors of the organization. As the head of the help desk team at Coca-Cola Israel's Central Bottling Company, Sarit must coordinate different IT centers to serve the needs of thousands of users, 24 hours a day. How does she do it? Pushing the definition of "hard work" to a new level, Sarit has succeeded in promoting a powerful SysAid Internal Campaign that has won the commitment of senior management and administrators. Now that's refreshing! Q. What is your IT background? A. I've been in IT for more than ten years, and I've worked in call center management for seven years. Q. How long have you been using SysAid? Q. What unique challenges does your IT department face? A. Our IT department provides services to several companies within the CBC group, and the work is tremendously demanding. We have about 100 administrators in our support team - 12 in the first level support team, and the rest spread throughout different locations. We provide support for thousands of people with a diverse range of needs and technical experience. The job requires expertise in support, infrastructure, and applications. Because our customers represent such a heterogeneous mix of different needs and technologies, the scope of our knowledgebase must be very broad. Possessing expertise that covers the entire technological spectrum requires a lot of experience and hard work. We provide around the clock support almost 24/7 (excluding Saturdays,) all year-round. Q. Before SysAid, what helpdesk software did you use? budget-range. One of our IT consultants then suggested that we try out SysAid. It looked promising, so we decided to give it a try. Within three months, we succeeded in implementing SysAid throughout our IT division. Q. What factors motivated you to switch to SysAid? A. As a group that values service as a distinctive part of our company's vision, Coca-Cola switched to SysAid with the primary intention of improving service quality. Part of my job includes evaluating the quality of the IT division's service-orientation. I needed to report directly to senior management about the level of service my team met, but I lacked the proper measurement and tracking system. I knew that without better helpdesk software, our support team would not be able to provide reports that accurately reflect the failures and successes of our system. I was also able to demonstrate how cost-effective SysAid is. SysAid itself is very affordable. It quantifies the service activities of our helpdesk, so we can accurately evaluate how our resources are being used and if we are truly maximizing productivity. When I showed senior management how simple, convenient, and intuitive SysAid is to work with, they became very enthusiastic. Q. Which tips can you give IT managers who want to implement SysAid within their own organizations? A. First of all, you should appeal to people on an intellectual level. You need to initiate cross-departmental meetings and share with different representatives the benefits on SysAid on an organizational and personal level. People of course respond to incentives, so it helps to organize festive, colorful, and fun activities. Most importantly, you must get management's support. It's impossible to effectively implement any new software if you don't have that. Q. Why did you to start the SysAid Internal Campaign in Coca-Cola? A. Our support team really craved change. We had gone through such a hard time with our previous system, and I saw how SysAid could transform the day-to-day activities of our IT department for the better. In particular, I wanted to get my second level administrators on board. Prior to SysAid, they had never used any kind of helpdesk software, but only communicated via email. It was very important to persuade them that SysAid would in fact benefit them. Q. What steps have you taken in your SysAid Internal Campaign? What are your strategies? A. I decided to create a festive atmosphere that would engage administrators and promote awareness. I decorated the support center with the SysAid posters we received, and I bought lollypops, balloons, and streamers. If I could, I would do something much more grandiose, company-wide. It would be great to have the resources to educate all the departments about how SysAid can improve the overall quality of service. Q. How do you motivate your administrators to use SysAid? A. Again, the biggest challenge was winning over my second level administrators. With my management's support, I was able to show them how easy SysAid is to use. With SAP-CRM, every service request took at least 7 minutes to document and process. With SysAid, it takes an average of one minute! Its documentation is quite fast, and I quickly get all the information I need for analysis. It's also very easy to customize, which we find absolutely crucial. Q. What feedback have you received from your levels 1, 2, and 3 administrators? A. The feedback has been absolutely fantastic. They think it's an amazing system. I have administrators who've worked with many different helpdesk software products in various support centers, and they just love SysAid. That's an enormous compliment, because they have a lot of experience and hold very high standards. In addition, the second level support's managers are now able to more easily and efficiently follow their team's services and activities. Q. How has SysAid simplified your day-to-day tasks? A. It's much easier to supervise the support center's activities. Tracking service requests is so much simpler. Furthermore, our customer base is always expanding, and we can now effectively handle the growing demands with the same number of administrators. SysAid helped meeting these new challenges. A. I am very collaborative. I share my visions with others, and want everyone to be included in all new projects and developments. I believe in the necessity of meeting with representatives from every department. If management, consulting, HR, and other departments are part of change processes, implementation can go much more smoothly. The more people included, the better - because in the end, they are the ambassadors of change. Orchestrating that kind of collaboration and cooperation can be challenging, but it's worth it. Furthermore, I would characterize my style as supportive and mission-oriented. Q. On a more personal note, how would you describe yourself? A. Actually, my management style and my personality are one and the same! Q. And how do you relax after a long day at work? A. I don't! Well, I do enjoy a good book, and I take every opportunity I can to rest. I really love sleeping. When he's not busy climbing mountains in Bavaria, Sven Nosse applies his energy to encouraging SysAid usage throughout Ebro. As a leading manufacturer of first-class measuring instruments, it should come as no surprise that Ebro has launched its SysAid Internal Campaign with precision and a fine attention to detail. With a distinctly personal touch, Sven has succeeded in convincing his colleagues of the value and benefits of SysAid. The result? No more "drive-by" service requests - Sven's end-users now report technical issues with SysAid and SysAid alone. That's a feat of truly great proportions! Q. How long have you been working in IT? A. I've worked with computers for about 12 years. My experience with computers began in 1987, the golden age of the Commodore 64. In 1990, I replaced my good old (still existent and working) Breadbox with a 286 model. That's when it all began. A. Around 4 months by now. Q. 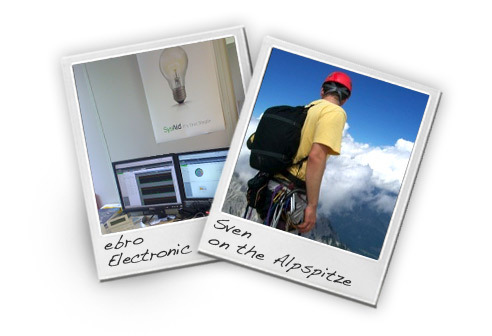 Why did you choose SysAid over other help-desk software products? A. SysAid is quite a good product for a fair price. I was looking around the market for an easy-to-use and affordable TTS solution, and I wanted an out-of-box experience that would be simple to deploy. I considered several products, even free ones like OTRS or ITSM, but I finally decided to use SysAid after I compared it to other products. I recommend SysAid to everyone, from small to medium-sized businesses, to help organize day-to-day tasks within a dynamic IT environment. Q. What SysAid modules and features do you find most helpful on a day-to-day basis? A. The automatic Asset Management and Helpdesk modules. I just love how the Asset Management Module detects assets and automatically takes an inventory. This really helps me keep an eye on installed software and licenses. We probably use the Help Desk module the most and it is working well for us. A. For end-users, the IT department used to seem like a "black box" that was vague and confusing. Introducing SysAid to Ebro has increased the transparency of the IT process for end-users, and now they know exactly what happens when they submit a service request. SysAid has helped keep end-users more informed than ever. As an administrator, SysAid helps me keep track of issues and document them with a trouble ticket system. This helps me keep track of changes and incidents. SysAid really helps identify problems with services and computer segments. A. I first planned to hold a keynote meeting, but I then instead decided to educate my colleagues and end-users about SysAid with small and personal conversations. I proceeded from office to office (luckily everything is located in one building) and explained to everyone how to use SysAid and the benefits they get from using it. I found it to be very effective. I have also promoted SysAid in the office by putting up SysAid posters I received for the Internal Campaign. Q. Why did you decide to start the SysAid Internal Campaign in your organization? A. We haven't ever had a trouble ticket system like SysAid here at Ebro. I decided that it is absolutely necessary to keep all colleagues and end-users well-informed to avoid any unease about SysAid. Q. How do you motivate your end-users to use SysAid? A. After explaining what SysAid does - how it lets you keep track of service requests, send an automatic screenshot, document the problem for further reference, use the Knowledgebase and so on - users are quite motivated to help us in order to help themselves. In addition, if a user comes along and tries to submit a "drive-by" service request, I politely remind them that we have this superb tool which they can use for entering such requests. This usually helps. Q. Have your efforts been successful? A. Yes! Our users mostly use the e-mail or service request shortcut combination to open new requests. The e-mail option is more preferred because users don't need to categorize the service request that much, as opposed to entering it via the hotkey combination. Q. What challenges have you faced in promoting the use of SysAid? A. Our users were very suspicious at first. They thought it would be inconvenient to manually enter service requests rather than picking up the phone and calling an administrator. In addition, our users feared that the IT staff would monitor their behavior or target less "keen-minded" users. Another prejudice was the misconception that the IT department might try to establish a profit center and bill users or departments for their services. After clarifying the situation, ours users gained the confidence that SysAid could only offer them benefits. Q. In what ways can you show your end-users that SysAid is beneficial? end-users and to clearly show what SysAid can do for them. If there is no doubt or confusion about the usage of this tool, then end-users will catch the SysAid spirit and start using it. Q. Do you think that awards and incentives are an effective way of encouraging usage? A. No, I don't think so. I think that if a user understands why SysAid is implemented and how it can help them, they will use it regardless of incentive. Q. What kind of feedback have you received from your end-users? A. They appreciate the transparency and the ease-of-use. Q. How has the SysAid Internal Campaign helped your IT performance? A. Our users now use only SysAid to submit service requests to the IT department. Q. Do you have any other feedback you'd like to add? A. I love the community spirit that comes along with SysAid. As provided before with the ITIL Package, I'd appreciate tutorial videos for other SysAid modules. I'd just love to see such a video for the Project Management module. Q. We're working on it! Aside from IT, what are your interests and hobbies? I enjoy good music as well as a good book. I'm also quite interested in keeping a system up and running, keeping up to date with the newest technologies, and sometimes I enjoy coding a small application. For the SysAid Internal Campaign, I would like to suggest how we can make it easier for end-users to submit Service Requests. This is essential to maximizing SysAid's benefits in your organization. Remember this simple rule: as opposed to picking up the phone and speaking directly with the IT support team, it is simpler, more efficient, and more effective for end-users to submit service requests. In the SysAid Certification program, we discuss in great detail how to make the submission of service requests much easier for end-users. It is very important to provide your organization with different ways to report technical problems. Accessing the End User Portal via the F11 command is just one of the many options you have. As an additional option for your end-users, we recommend that you provide your users with service request forms directly on your company's website. Why is this important? First of all, users intuitively search their companies' websites for support information. It makes sense to allow them to submit service requests in a location they already regularly access. Furthermore, this option is very helpful for users who do not have direct access to the internal SysAid system. For example, if users on a business trip encounter technical problems, they can access SysAid through the company website and receive immediate support. All you need to do is create a new web form, and convert it to HTML. 2. Press the New Form button. 3. You can add fields by designating "Available Fields" as "Visible Fields." Once you've chosen which fields you want to display in the form, choose "Save." 4. You will then see the new form has been added to the list. Select the new form, and from the HTML tab, copy the entire HTML code. 1. Access the web server from which you want to new form, if using a foreign server. 3. Return to the Web Forms tab in SysAid, and left click on the Images Directory link. 4. Extract the CSS.zip file and save it in the folder with your new web form. 5. Go back to the Web Forms tab and right click on the "HTML settings" link. Choose "Save File As..." and save the master.css file in the CSS folder. Note: If you aren't using your own server, skip Steps 3 and 4 and just place the HTML file in the .../SysAidServer/root folder. SysAid is already intuitive and user-friendly for end-users. Make the experience even better by providing easy access to service request forms! If you're a newcomer to the field of IT looking for the advice of a seasoned professional, look no further - Emma Nicolosi from Ordine Mauriziano Hospital is a true expert. Having worked in IT for more than 20 years, Emma possesses the know-how that provides one of Turin's most prominent hospitals with superb technical support. Emma's other important area of expertise? Italy's best travel destinations! A. I started using SysAid in 2007. Q. How did you first learn about SysAid? A. I discovered SysAid on the Internet looking for a good Asset Management software package. Q. What are your main responsibilities at Ordine Mauriziano? A. I oversee all activities concerning IT security, network infrastructure, and technical support. Ordine Mauriziano is the second most important hospital in Turin, and we have a very well-established and capable IT department. Q. How many users and administrators does Ordine Mauriziano support? A. We have 14 administrators and more than 1,000 users. We use SysAid to process service requests regarding technical hardware and software problems encountered on computer and printer assets or network appliances. Q. What unique challenges do IT professionals face in the healthcare sector? A. For IT professionals in general, a unique challenge is virtualization and the use of massive storage technologies like SAN or NAS. In the healthcare sector, we have the particular difficulty of using technologies that bring our patients' computerized medical records to their bedside. For the exchange of clinical data and information, we use standard communication protocols like HL7, XML, and other wireless networks. Q. Have you used any other helpdesk software products? How does SysAid compare? A. Before SysAid, we used software which we developed internally. The software didn't have all the system integration features that SysAid offers, such as integration with LDAP servers, IIS/Apache web servers, and other server platforms. After considering other commercial products, we chose SysAid because it was so affordable. It offered features similar to those included in other commercial products for a more competitive price. Q. How has SysAid helped your IT performance? A. SysAid has been a good platform to help us carry out effective technical support. Since SysAid is completely integrated with the LDAP directory, we have a single platform to work with assets and users in the domain. Moreover, it is quite user-friendly and it can be customized very easily. Q. Our support experts have been impressed by your technical expertise. What's your next project? problem-solving tasks and how they can be integrated with service requests. In fact, I'm working right now on writing specific service-oriented protocols, and planning implementation strategies with the CMDB module. That way, we can find our bottlenecks and make the necessary adjustments to increase efficiency and provide faster and better responses. Q. What SysAid resources have you found helpful in resolving IT issues? A. I have used the SysAid Community as a resource for targeting specific technical issues. On different forums, I have asked questions about installation and configuration. I also communicate with the SysAid support team by submitting my own service requests. Q. 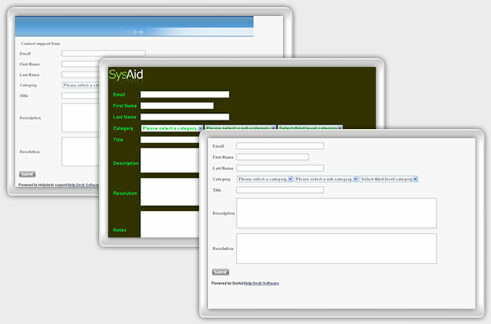 What feedback have you received from your administrators and end-users about SysAid? A. SysAid has pushed my administrators to develop more organized work plans. They now work more carefully because they know that SysAid keeps track of how and when they address user issues. They are held accountable for what they do and when they do it, so they need to be responsible. Unfortunately, as far as our end-users are concerned, not enough of them use SysAid to submit service requests. They haven't yet fully taken advantage of SysAid's functionalities. Q. In that case, you will find this month's newsletter particularly helpful! Using SysAid Internal Campaign strategies, you can motivate your end-users and administrators to use SysAid and appreciate its benefits. Do you plan to initiate such a move? A. Our difficulties with certain end-users are related to their resistance to IT in general. Getting them to use SysAid thus requires some time and patience. We have already started instructing end-users how to use SysAid through internal courses we teach. Q. In the largely male-dominated IT industry, do you think women have a different approach to problem-solving, management, and IT in general? A. Yes, I believe that women have a different approach to the entire business world. I think women tend to be less money-driven, more people-oriented, and more service-committed than men are. Rather than only focusing on how much money we can make from a certain business, we are more conscientious of making sure that the client - be it patient or end-user - is satisfied with the service we provide. Q. On a different note: for a young graduate considering a career in IT, what advice do you have to offer? A. Specialize in either software development of web-applications or network security. I think that at the moment, those two IT sectors are in the greatest demand. Q. Italy is a popular tourist location for people around the world. In your opinion, what place is a must to visit for the next trip to Italy? A. Since all of Italy is beautiful, this is a difficult question to answer! Many touristic places are very well known abroad, but are not necessarily the most beautiful, in my opinion. I think that Piemonte, the region I live in, has a very interesting concentration of cultural and artistic sites - especially in Turin (or Torino, as we Italians say.) There are many beautiful hills like Monferrato, Langhe, and mountains like Monviso and Monte Rosa, and you can find great food and wine in towns such as Barbera and Barolo. Q. Finally, how would you describe yourself? hard-working, stubborn, reliable, and always interested in facing new challenges. Could you be next SysAider of the Month? Only one way to find out! Simply fill in our quick 2-minute Application Form, for your chance to win a sensational SysAid prizes and more. Award categories include: SysAid Moderator, Community Contributor, Loyal SysAider, Internal Promoter and SysAid Evangelist. Don't miss out! What Percentage of your Service Requests are Submitted through the End-user Portal? In the spirit of the SysAid Internal Campaign, this month's poll focuses on an issue vital to the health of every IT department: how, exactly, are your end-users reporting their technical issues? Are they calling your work line or your cell phone? Are you receiving text messages via SMS? Do your coworkers grab you at your lunch break and tell you about their computer malfunctioning right then and there? We know, of course, that in order for an IT department to function most effectively and efficiently, it's important to get end-users on board and enthusiastic about using SysAid in their day-to-day routine. 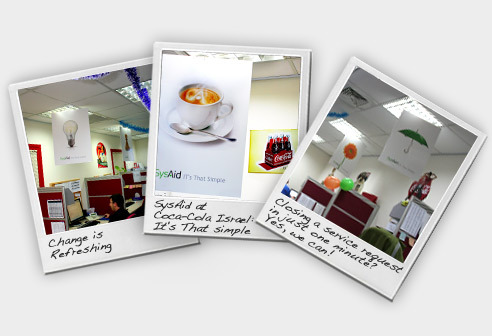 The goal of the Internal Campaign is to motivate your end-users to submit their service requests with SysAid. Now's the time to assess and quantify your end-users' activities. Approximately what percentage of your service requests are submitted through the end-user portal? Take our poll and share your experiences with us. If you have any ideas about how to increase usage of SysAid among your end-users, feel free to share those ideas with others! When striving for IT success, there is apparently no singular, magic solution. The majority of SysAiders (40%) agree that dedication and hard work are the keys to success, but a sizeable 27% of SysAiders believe that quality of service is the most important. Technical expertise (15%) and initiative (10%), while still vital, have fewer followers. The only thing that appears less necessary? Only 6% of SysAiders gave a thought to networking and connections! SysAiders represent wide group of diverse strengths, and most can probably agree that success results from a unique combination of intelligence, skills, and stick-to-itiveness. Congratulations to this month's contest winner!